Yesterday, I woke to the trill of songbirds and something fluttered in my spirit. Had spring officially arrived? I opened the windows and let the fresh cool air meander through the house. The cats lounged on the sills for hours, tails twitching at robins and noses sniffing the breeze. To my nose, the air smelled of dirt, and growing things, and promise. The neighbor’s weeping willow had sprouted graceful wisps of flourescent green hair and daffodils lazily nodded their sunny yellow heads. Yes, spring had arrived and was working its magic. My response to all this renewal and rebirth? I set out some eggs to warm up and butter to soften and decided to bake something lemony. Lemon, in my humble opinion, is the perfect taste to complement spring – fresh, clean, and bright. I grabbed some lemons from the fridge and began mentally sifting through my favorite lemon recipes. Lemon bars, lemon cookies, lemon pudding cake, lemon quick bread, lemon poppy seed muffins. 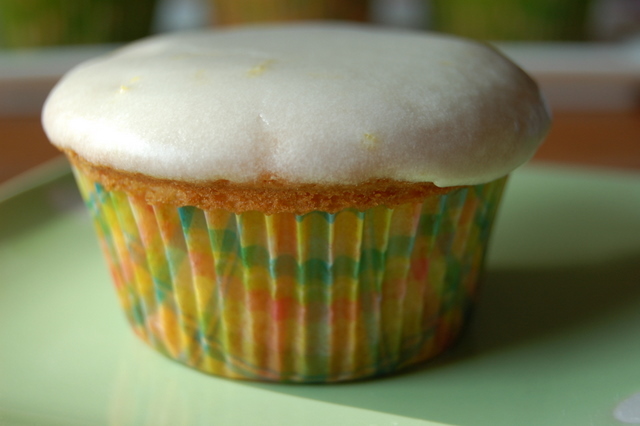 I finally settled on Lemon Cream Cupcakes, a recipe I found years ago in a Taste of Home magazine. The choice was pretty easy. Just the thought of these cupcakes made my mouth water. Besides, I’d recently bought really cute baking cups at Michael’s that I was itching to use and this was the perfect opportunity. Although simple in appearance, Lemon Cream Cupcakes are to die for. I mean this with the utmost sincerity. My husband phoned me five minutes after leaving for work this morning simply to talk (a.k.a. rave) about the cupcake he’d just eaten for breakfast. Lovey’s friend describes them as “life-changing”. I don’t know about that, but I will say that they offer a few minutes of edible heaven. Now I ask, what better way to celebrate spring than by baking and eating these morsels of lemon perfection? I want to personally thank Ruth Ann Stelfox of Raymond, Alberta, whoever you are, for submitting your fabulous recipe to Taste of Home and sharing it with the world, and more personally, with me. And now, it’s my turn to be gracious, because something this sublime is just too wonderful to keep to myself. Preheat oven to 350 degrees. Line muffin tins with paper liners (the cuter the better). In a mixing bowl, cream together butter and sugar (approximately 2 1/2 to 3 minutes). Combine dry ingredients; add to creamed mixture alternately with sour cream. Begin and end with dry ingredients. Batter will be thick. Go ahead – taste it. Bet you can’t stop with just one lick. Fill liners with 1/4 cup batter. Don’t overfill or you’ll end up with wide flat tops on your cupcakes – still tasty but not pretty. Bake for 25-30 minutes or until toothpick inserted near center comes out clean. Cool for ten minutes; remove to wire racks to cool completely. Cream butter and sugar in a small mixing bowl. Add lemon juice, vanilla, lemon peel, and milk. Beat until smooth. Frost cupcakes. I’ve found that dipping the cupcakes in the frosting works just as well as the traditional method and it’s quicker. Time for a sample (or two). Ah, springtime from the oven. This recipe yields about 2 1/2 dozen cupcakes. i am going to bake these this weekend! Let me know how they turn out. I don’t think you’ll be disappointed!